The shelves of the market where I shop still swell with Georgia and South Carolina peaches and I just keep buying them. I know I’ve probably overdone the peach thing this season, but I seriously can’t get enough of them. So, I’m not apologizing as I post yet another delicious peach recipe. After all, I do live in Georgia, and that’s what we do, right? As I thought about peaches, I knew I wanted this recipe to blend sweet and savory flavors and to incorporate some form of cheese. Enter flatbread. Flatbreads, typically made without leavening, hold significance in the Jewish and Christian religious in the form of matzo and communion wafers, respectively. They trace back to ancient Egyptian times. My flatbreads serve no religious purpose nor are they unleavened. They simply perform the duty of featuring brie and peaches spiced with chipotle peppers. For this simple recipe, I used prepared pizza dough from my farmer’s market. Most supermarkets now carry prepared dough and using the pre-made dough makes this recipe super simple. For this recipe, I divided the dough into ten portions, and each flatbread delivers several bites. You could certainly divide the dough into smaller bite-sized portions for appetizers. A couple of the larger flatbreads with a simple salad makes a delicious and healthy lunch. A single flatbread makes a perfect starter for a dinner party. Before peach season winds down, try these flatbreads as a way to feature this delightful fruit. 1. Preheat oven to 450 degrees. Place pizza stone or baking sheet in oven for 20 minutes while oven is preheating. 2. Divide pizza dough into 10 portions and roll out into thin ovals on floured surface. Brush dough with olive oil and place on pizza stone or baking sheet in oven. Bake for 5 to 8 minutes or until lightly browning. Remove from heat. 3. Microwave jelly in small cup for 30 seconds or until melted. Add chipotle pepper to jelly, mix well, and cool. Pour jelly mixture over peaches and mix well. 4. Slice brie and place slices on browned flatbreads. Place flatbreads back into oven and bake for 5 minutes or until brie is completely melted. Remove from oven. 5. 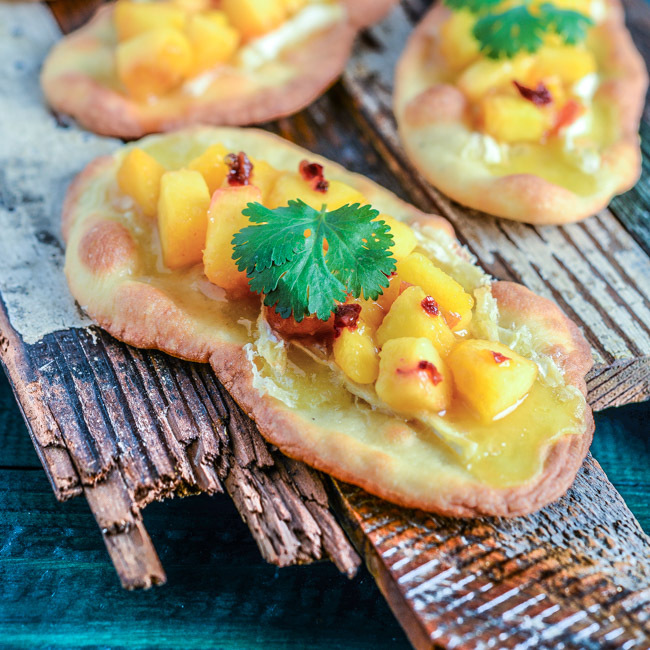 Top flatbreads with peach mixture and garnish with cilantro leaves. Serve immediately. Peaches and chipotle – oh my!!! Love that you put all of this goodness on a pizza dough flatbread. That’s quite ingenious and I bet it offers a lot more flavor than “bread”. Great little snack! We’ve been overdoing the peach thing this season too. And we love the combo of sweet peaches and something that’s spicy hot, so this is perfect for us. Thanks. I LOVE the flavor combinations here! And I love the excessive use of peaches! That is totally our prerogative down here in GA. Now you have me craving flatbread at midnight! BAD! Are you going to the TECHmunch in Atlanta next month, btw? I hope you are serving those delicious peach and brie flatbreads with a cool crisp sparkling wine 🙂 Another great dish. I always enjoy your posts. Wow how amazing do these look? I’m in love with them!